Three more victims of the US-Bangla plane crash were laid to eternal rest at their respective villages in Rajshahi, Barisal and Khulna on Friday, reports UNB. The victims are freedom fighter Nazrul Islam, Alifuzzaman and Piyash Roy. In Rajshahi, Nazrul Islam was buried with state honour at Gorhanga graveyard in the city in the afternoon. He was buried beside the grave of his wife Aktara Begum who was also killed in the plane crash. Aktara was laid to rest on Tuesday. Earlier, Nazrul's second namaz-e-janaza was held at Upashahar central mosque after Juma prayers, said victim's daughter Kakon. His body was taken to the city from his Begunbari village home in Gomastapur upazila of Chapainawabganj after his first janaza there. In Barisal, the funeral of Piyash Roy was held at Barisal Mahaswashan around 12 noon. An ambulance carrying the body reached his home in Shitla Khola area of the city around 3:30am. The body of Piyash, who was an MBBS student of Gopalganj Sheikh Sayera Khatun Medical College, was first taken to its campus around 12:45am. In Khulna, Alifuzzaman, another US-Bangla plane crash, was buried at Yusufia Madrasa graveyard in Rupsa upazila around 3:00pm. His namaz-e-janaza was held at Belfulia Islamia High School playground in the upazila after Juma prayers. 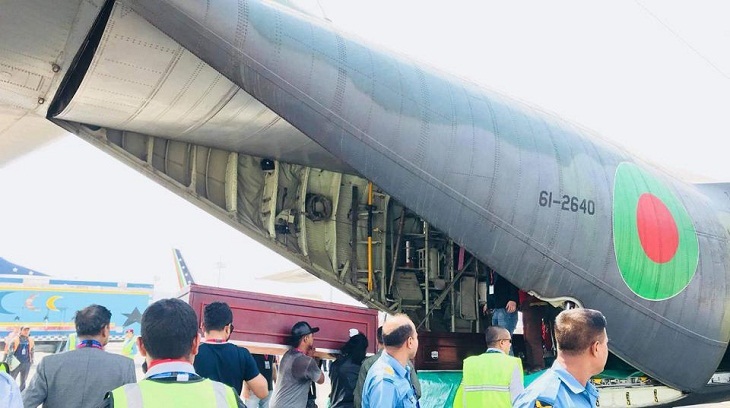 Earlier, respective family members received the bodies at Hazrat Shahjalal International Airport in the capital on Thursday afternoon. At least 49 people, including 26 Bangladeshi nationals, were killed as the US-Bangla Airlines aircraft crashed and burst into flames at Tribhuvan International Airport in the capital of Himalayan county Nepal on March 12.